Synthetic peptide corresponding to Human KAT3A/ CBP aa 162-176. Cyclic AMP-responsive enhancer binding protein (CREB) binding protein (CBP) and p300 are closely related transcriptional coactivators that have been shown to directly interact with many different DNA-binding transcription factors including nuclear hormone receptors, CREB (cyclic AMP-responsive enhancer binding protein), c-Fos, c-Jun/v-Jun, c-Myb/v-Myb, TFIIB and MyoD.Both CBP and p300 have been shown to display histone acetyltransferase (HAT) activity, capable of acetylating all four core histone particles in nucleosomes.As a result of HAT activity, it has been suggested CBP and p300 may play a direct role in activating chromatin for transcription.Single point mutations in CBP have been proposed as causative factors in the developmental abnormalities of Rubinstein-Taybi syndrome (RTS).Although both CBP and p300 appear to function similarly, the inability of p300 to rescue CBP malfunction iRTS suggests intrinsic functional differences between CBP and p300. Our Abpromise guarantee covers the use of ab2832 in the following tested applications. WB Use a concentration of 1 - 2 µg/ml. Detects a band of approximately 265 kDa (predicted molecular weight: 265 kDa).Can be blocked with Human KAT3A / CBP peptide (ab4916). Recommended to be used at 2-4µg for 1-2x106 cells. Inhibition Assay Use at an assay dependent concentration. Acetylates histones, giving a specific tag for transcriptional activation. Also acetylates non-histone proteins, like NCOA3 coactivator. Binds specifically to phosphorylated CREB and enhances its transcriptional activity toward cAMP-responsive genes. Acts as a coactivator of ALX1 in the presence of EP300. Note=Chromosomal aberrations involving CREBBP may be a cause of acute myeloid leukemias. Translocation t(8;16)(p11;p13) with MYST3/MOZ; translocation t(11;16)(q23;p13.3) with MLL/HRX; translocation t(10;16)(q22;p13) with MYST4/MORF. MYST3-CREBBP may induce leukemia by inhibiting RUNX1-mediated transcription. 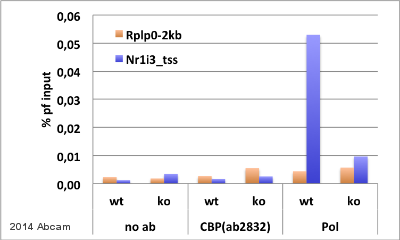 Defects in CREBBP are a cause of Rubinstein-Taybi syndrome type 1 (RSTS1) [MIM:180849]. RSTS1 is an autosomal dominant disorder characterized by craniofacial abnormalities, broad thumbs, broad big toes, mental retardation and a propensity for development of malignancies. Contains 2 TAZ-type zinc fingers. Contains 1 ZZ-type zinc finger. The KIX domain mediates binding to HIV-1 Tat. Methylation of the KIX domain by CARM1 blocks association with CREB. This results in the blockade of CREB signaling, and in activation of apoptotic response. Sumoylation negatively regulates transcriptional activity via the recruitment of DAAX. Cytoplasm. Nucleus. Recruited to nuclear bodies by SS18L1/CREST. In the presence of ALX1 relocalizes from the cytoplasm to the nucleus. Sonicated chromatin prepared from U2OS cells was subjected to the ChIP procedure with ab2832 to CBP. Immunoprecipitated chromatin was analysed in the promoter region of c-FOS (active) and in exon 2 of MYO-D (inactive). Values are % of inputs. 2–4 µg of ab2832 and 1-2x106 cells were used in each ChIP experiment. Immunofluorescent analysis of MCF-7 cells, labeling KAT3A/CBP with ab2832 (right) compared with a negative control without ab2832 (left). Cells were formalin fixed, permeabilized with 0.1% Triton X-100 for 5-10 minutes, and blocked with 3% BSA-PBS for 30 minutes at room temperature. Cells were incubated with anti-KAT3A/CBP diluted 1/100 in 3% BSA/PBS overnight at 4°C. Actin was stained using Alexa Fluor 554 (red) and nuclei were stained with DAPI (blue). The nuclear localization of KAT3A/CBP can be observed (green). IHC image of KAT3A/CBP staining in human pancreas formalin fixed paraffin embedded tissue section, performed on a Leica BondTM system using the standard protocol F. The section was pre-treated using heat mediated antigen retrieval with sodium citrate buffer (pH6, epitope retrieval solution 1) for 20 mins. The section was then incubated with ab2832, 5µg/ml, for 15 mins at room temperature and detected using an HRP conjugated compact polymer system. DAB was used as the chromogen. The section was then counterstained with haematoxylin and mounted with DPX. 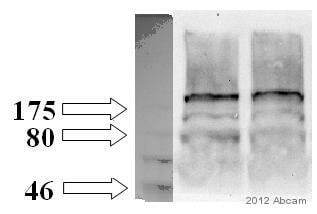 Immunofluorescent analysis of HeLa cells, labeling KAT3A/CBP with ab2832 (right) compared with a negative control without ab2832 (left). Cells were formalin fixed, permeabilized with 0.1% Triton X-100 for 5-10 minutes, and blocked with 3% BSA-PBS for 30 minutes at room temperature. Cells were incubated with anti-KAT3A/CBP diluted 1/100 in 3% BSA/PBS overnight at 4°C. Actin was stained using Alexa Fluor 554 (red) and nuclei were stained with DAPI (blue). The nuclear localization of KAT3A/CBP can be observed (green). Immunohistochemical analysis of FFPE mouse colon tissue, labeling KAT3A/CBP with ab2832 (right) compared with a negative control without ab2832 (left). Heat antigen retrieval performed with 10mM Sodium Citrate (pH 6) for 8-15 minutes. Tissue blocked with 3% H2O2-methanol for 15 minutes at room temperature. Incubation with ab2832 diluted 1/2000 in 3% BSA-PBS overnight at 4°C. Counterstaining with hematoxylin. Immunofluorescent analysis of NIH-3T3 cells, labeling KAT3A/CBP with ab2832 (right) compared with a negative control without ab2832 (left). Cells were formalin fixed, permeabilized with 0.1% Triton X-100 for 5-10 minutes, and blocked with 3% BSA-PBS for 30 minutes at room temperature. Cells were incubated with anti-KAT3A/CBP diluted 1/100 in 3% BSA/PBS overnight at 4°C. Nuclei were stained with DAPI (blue). ab2832 using HeLa cell lysate. ab2832 using HeLa cell lysate. Synthetic peptide: ATSSPATSQTGPGIC, corresponding to amino acids 162-176 in the nuclear factor binding domain of Human CBP. From the webpage you can do a BLAST via NCBI. I have done this search and no p300 protein hits are generated. If you wish you can also align p300 to this peptide to ensure there are no large regions of identity between the 2 sequences. I hope this is helpful. Please contact me again if you have any further questions. I am looking for a CBP or P300 antibody to use ChIP assay using zebrafish embryos. What would you recommend from your antibody list? Please let me know if you find any. Thank you so much in advance. Thank you for contacting us. We have the following antibodies in our catalog that where tested in ChIP: for CBP: ab2832, ab10489, and ab10490 for p300: ab14984 None of the antibodies has been tested so far in zebrafish. If you could send me please the protein sequences for zebrafish, then I can check the homology. If the homology is about 85% or higher, you can participate in our testing discount program. For UNTESTED species and/or applications, we have established a testing discount program. Here is a brief description of how it works: The testing discount program is for customers who like to use an antibody/protein on an untested species/application. You would purchase the antibody at full price, test it and submit an Abreview with your data (positive or negative). On your next order you will receive a discount for ONE antibody at the full price (100%) of the antibody you have tested. The terms and conditions applicable to this offer can be found here: www.abcam.com/collaborationdiscount. Please let me know the zebrafish sequence and I can check which of the antibodies might be suitable to try in this species. I hope this information is helpful to you. Please do not hesitate to contact us if you need any more advice or information.